Father Richard Walz is one of our masters at making and crafting rosaries. Fr. Richard began making rosaries soon after he returned from his appointment in Belize in 2003. He began by making mostly rosary bracelets, as that was something different and he didn’t want to flood the market and become competition to the other Rosary making monk: Br. Louis. Not surprisingly, it doesn’t take long to make enough bracelets for everybody in the neighborhood and so he soon turned to making rosaries. When Br. Louis got to the point where he could not see well enough to make rosaries any more, Father took up the slack copying many of his ideas. He began making “Trojan Rosaries” [Orange & Blue beads], “Holstein Rosaries” [Black and White beads with no particular order], and other rosaries based on school colors. His little area grew when one of his sisters gave him a fruit jar of Job’s Tears beads that his mother, Bertha, had grown sometime in the mid 1990s. Soon after that he made a Job’s Tears rosary for each one of his brothers & sisters and gave it to them for Christmas that year. Then he started actually growing Job’s Tears himself and making more rosaries. People are often amazed when he shows them his Job’s Tears plants growing in the garden. 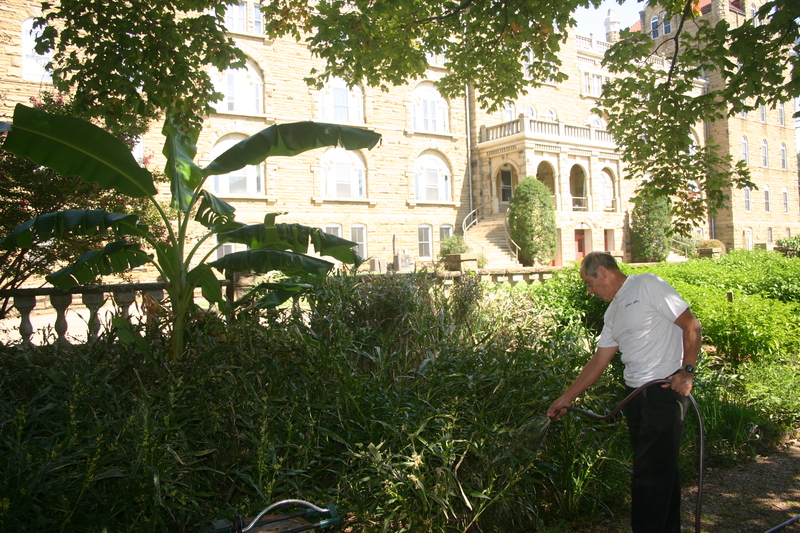 The plant looks a lot like Johnson Grass, but it produces the beads that he now uses to make rosaries.He cultivates them diligently in our Abbey gardens with lots of care and watering. When the seeds are ready, they are picked and then a small hole is drilled through each one. He then carefully uses wire and other rosary tools to make this internationally famous rosary that most people remember as "Mother Teresa's Rosary." Some call it a living rosary, and others call it simply a "Job's Tears" rosary. This is truly a rosary that takes months to make and it lasts a lifetime.